I met Louise and James to take their engagement photos! I would carry on but wouldn’t do Edward Thomas justice! Louise’s parents live in Adlestrop, a beautiful village in the heart of the Gloucestershire countryside and their wedding is going to be here in the summer. The church is being re-roofed especially and it will the first time the church bell will be heard ringing in decades! Can’t wait! They are such a gorgeous couple I know it’s going to be a cracking day. 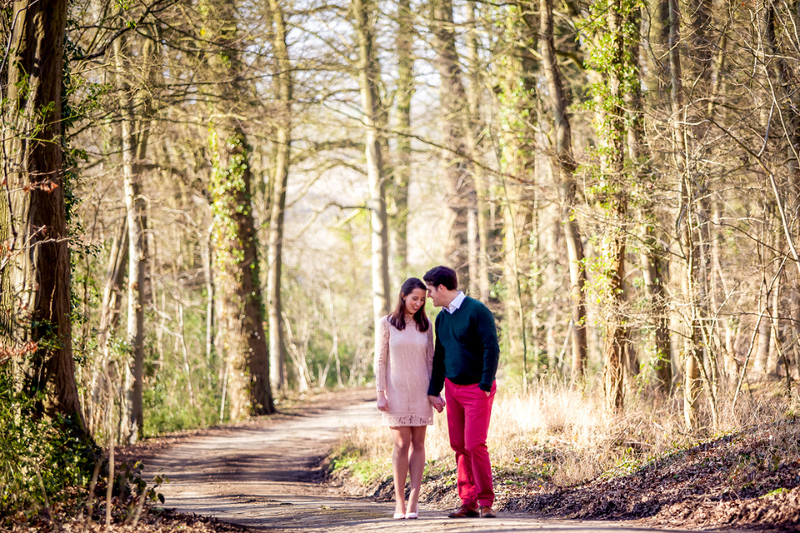 Doing Gloucestershire engagement photography means you’ve got to get out into the countryside and take in the views – and Adlestrop has plenty! The weather was amazing. Louise had the forethought to have two pairs of shoes so her lovely heals didn’t get ruined as we schlepped across horse-torn fields. And James, unlike some grooms, was totally comfortable with the camera. My work here is done! I absolutely love doing these engagement shoots. It gives me such a great opportunity to spend a bit of time with both the bride and the groom and get the know them a bit before their big day. It also gives them the chance to know me too. Love a win-win!